I recently returned to work from maternity leave and noticed by purse looked a complete mess from receipts, coins, cords, cards, and hair ties. Before going on leave I had a nice system and my purse was rarely messy. 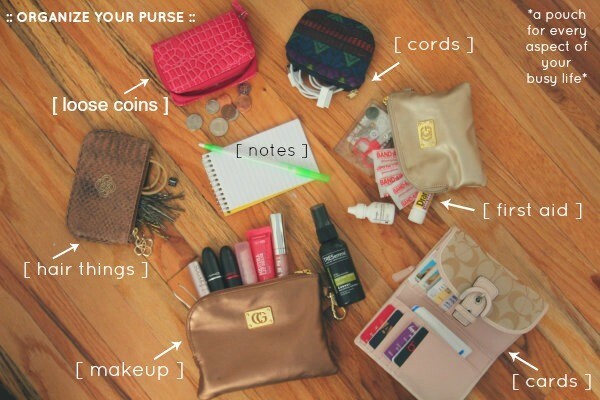 I followed the following steps to get and keep my purse organized. With the day to day hustle of life, it is nearly impossible to clean your purse daily. So, decide to clean it once a week. I found that using separate cases inside your purse will keep things more organized. Example: I am a planner so I have a different pouch for my stickers, pens, color pencils planner. I have a separate pouch for all my receipts and once I get home I put them in a box labeled receipts. You can find some cute coin pouches to store all your loose change. This will help keep your purse organized. I have a separate small bag or diaper bag for my son’s toys so my purse will not be cluttered with his stuff. The small pouches keep the smaller bits and pieces together in a single place to keep everything together and not tossed around the bottom of the bag. I keep some of my items that I use daily with me such as lip care, business cards, mini tape measure, nail clippers, headache oil, face powder, and hair ties. Shirelaih Leisa is a Atlanta based momtrepreneur, mommy blogger and kickball junkie. Currently working on the launch of her mommy blog Dope Momme to share with other parents helpful parenting tips. To connect with Shirelaih Leisa Follow her on Instagram at: @__brownbeauty or @dopemomme and Facebook at: Shirelaih Leisa. The Key to Surviving the Dating Game: Keep Playing until you WIN!